I have heard this series is intended for a younger audience than Hunger Games…. is that your impression? I am not John, but I can answer this. Yes they are for a younger audience. I am always trying to find excellent books to recommend to young readers so I read this series. Some of it is disturbing if the reader doesn’t like bugs, and the family situation is troubling, but it was “meaty” and kept me hooked. The vocabulary and length are also geared to younger readers. I enjoyed these books precisely because I couldn’t figure out where it was going- and I have read so much that a predictable story- unless it is a known “classic” is boring. these were satisfying. My son is reading them now and really enjoying them. It is a great spring board for conversations. I really recommend them (I read the series through first before giving them to my son). My son was 11 when he started and has turned 12 just like the hero does during the series. It does have violence like is mentioned but it is packaged in a more fantastical setting with such fantasy elements that I think it makes it a little easier on kids to read. It could be a great segue into The Hunger Games series for those kids who are interested to read it but not quite ready. Thanks for the write up John and fly you high! Run like the River, Lynn! Thank you! My 11 year old has asked about reading the Hunger Game, having heard his teenage sister and I discussing them, but I’ve been putting him off, thinking 13-14 was a more appropriate age. I just requested the first two from my local library… we’ll see if he likes them. He has been enjoying both the Kane Chronicles and 39 clues series, though I haven’t read either myself. Louise, my son has read a variety of books and really enjoyed the Percy Jackson series as well as Ender’s Game (which admittedly was above level from a complexity standpoint when he read them the summer before 5th grade, but he loved it.) I hope he rereads that in a couple of years to get a deeper level of meaning. I am not sure how that compares with the books your son likes, but I think there might be some commonality. The point of all that is that my son is really enjoying these books and he is on the second to last book now. I think that your son really might like them but you might want to read them too because Collins does not shy away from the tough subjects. There is a section in the back of my son’s copy of the first book encouraging kids to develop their own undiscovered world and then write about it. My son did just that, and anything that encourages boys of this age to write makes me happy. We have also had some really good conversations about some of the themes. I hope your son enjoys them! I read these years ago and loved them. I’m very happy to come across this post and have been wondering for a very long time when you would mention them. What I remember most was the theme of overcoming prejudice and the various political twist of the stories. I’ve got them down on my list of books I hope to re-read this year. I grew rather fond of Ripred the Rat, and Luxa. I love this post. I read the Underland Chronicles years ago, and then I spent the next few years refusing to read the Hunger Games because I believed that NOTHING could EVER be that riveting. But anyways, I think you’re spot on with this post. You brought up some interesting points that I never considered (“this world way beneath our world never bleeding into our world”). Awesome job. Im an 18 year old girl . I loved the hunger game sereis . Would I really enjoy this sereis? To the point where it would be hard to put down the book? Megan, they are written more simply than The Hunger Games as they are aimed at Middle Readers. With that said, I zoomed through them quickly and really enjoyed them right along with my son and I am 38. I would recommend staying with the books past the first one to give them a fair shot (occasionally I have heard that the first doesn’t grab you as quickly as The Hunger Games does). You might be able to put the first one down but as the series goes on you will be reading it and not wanting to put them down. They are very fast reads. Megan, I think you will love them. My sister urged me to read them and I am so glad I did. I admit I resisted at first, why would I want to read about giant coach roaches and rats? It didn’t sound very interesting to me. The third book was my favorite and They are so easily overlooked as a series for kids. I laughed, I cried, I loved the whole experience and so did most of my family of ages 10-65. Okaaay… I see two problems with this. Second, John gave the Rat farewell. You say “run like the river” to rats. First, think of Alice in Wonderland and the drop into the Rabbit Hole, not Newtonian mechanics. You’re on the wrong page of music if you think this is a Physics class. Second, I believe Ripred tells Gregor more than once to “run like the river” as his farewell. It’s a rat farewell, certainly, but not just to other rats; given my appearance and character, it’s more than appropriate (if simultaneously a little self-deprecating and flattering) to say Ripred’s line. So I am now the age of sixteen, yet I remember almost vividly reading this series 🙂 they were just well written books and I highly recommend them to whoever is interested! But now I must move on to other books for school 😛 currently doing a project on The Road, but if there are any other good book series like this let me know! PS I’ve already read Percy Jackson, Artemis Fowl, Children of the Lamp, Peter and the Starcatchers plus others, but this will always be one of my favorite series. Are you looking for series recommendations or just books in general Daniel? Also, are you looking for books that have this deep alchemy or just general good reads. I will have to defer to some of the more sophisticated readers around here for the deeper leveled books. My son recently read Unwind by Neal Shusterman and it dives into some pretty unsavory ethical issues without giving opinions or answers. Not sure it has anything to interest The Hogwart’s Proffesor but it was still a good read. He writes a lot of interesting books and my son is about to start his skinjacker trilogy. The first one is called Everwild. I will be reading them too. 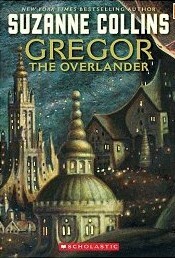 Gregor the Overlander is an amazing series and the reason I decided to even pick-up the Hunger Games series for my son. I’ve read almost every book I buy for my kids which means I have also read the entire series of “Harry Potter”, “Twilight”, “39 Clues”, “Gregor the Overlander” and “Hunger Games”. But I no longer watch movies as they never seem to be as satisfying as the books were. I also think it’s great and important to note that the hero and his family are African-American. It’s so rare to see this in a series. 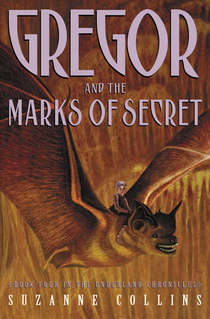 That Gregor and Boots survive the drop is explained in the first book and in subsequent books Gregor has other entrances into the world and does not always have to enter via falling. But I do agree that even with these explanations John says it best: “First, think of Alice in Wonderland and the drop into the Rabbit Hole, not Newtonian mechanics. You’re on the wrong page of music if you think this is a Physics class.” it is best to approach this series for it’s magical qualities not it’s dependence on our reality for validation. My brother and I read these about five years ago and both loved them, we also read the Hunger Games as soon as they came out. I personally preferred The Underland Chronicles. I think both have a very unique plot, but for some reason I like the Underland Chronicles. I also love how Collins’ isn’t afraid to kill off main characters. I think that really adds to the story. That being said this is the only series of books I have read multiple times and there are very few single books that I have read over. I would more than reccomend it. When I tried to invite my friends to read they said it sounded childish, however, there may be some juvenile elements, but the overall meaning of the story is profound and something adults would enjoy! I Love Hunger Games and Under World Chorincles. I also admire Collins for being able to kill off main characters. (It really makes me mad, sad, and want to never read again, but it’s admirable.) 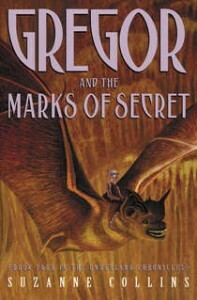 I LOVE the Hunger Games and the Gregor Chronicles. I’ve read each book about five times (or more). I really find that the end of Code of Claw is disappointing. I end up rewriting the end. I really hope (with all of my heart) that Collins will add another book to this series. It’s just, so, sad and disappointing, and not living up to my expectations. But other than that, I love the books and will continue to reread them. I urge everyone who has not read them to march to the nearest library and start reading!!! I totally agree with Rachel. I was flipping through the last pages of the code of the claw like crazy, just to be left kind of disappointed. It’s so hard to put these books down! I really hope Suzanne will give us just one more book in the chronicles to wrap it up some. I’m 25, I see how they are aimed towards kids, but I had no problem enjoying them front to back. I read them to follow up the hunger games although I found myself enjoying them more I believe. Ripped and Ares are my homeBoys! How long are the books as in approximately how many pages? I was 11 when I started and now I’m 12 just like Gregor. Anyway, I LOVED this series and it was amazing, just the whole story and adventure was great. I think Suzanne Collins should DEFINETELY write another Gregor book and I don’t care how she ended it, she just can’t end a great series like that. She left so many gaps open and I was really disappointed. I read these books basically as they came out, when I was ten or eleven. I’m now eighteen years-old and still absolutely adore the series. For all the parents who are reading these, I’d highly reccomend them to you for your children, and even just for you. The text is a little bit larger and the words are a little bit smaller, so all of the heavy context of the book is easier for young minds to grasp. The protagonist is easily relatable to any eleven year-old boy, and each of the othe characters are endearing in their own way. The series definitely was the first real spark in my interest in reading. Anyway, that’s my two bits. Fly you high, readers. I don’t recommend you reading this review if you haven’t finished the Gregor series. I started reading these books when I was twelve, and I could not put them down! I thank my sixth grade reading teacher and now seventh grade english teacher for introducing these to me (love you, Mrs. Geske!). @ Gluxa 4 ever: I’m not trying to start any internet fights, but I rather disagree about Ms. Collins writing another book. The war is over; what exactly would she write about? Moving to Virginia? She only writes from Gregor’s point of view, so she couldn’t exactly write about cleaning up after the war or fighting the cutters or anything else going on in the Underland. Besides, I thought she ended the book absolutely perfectly. I was a bit dissapointed, too; at first, I wondered what would happen in the end; then I realized that was the end. About making a movie…it would be interesting to watch, but Ms. Collins just wrote it so perfectly that what if the movie-making people messed it up? I know I would watch it, but I think I would be dissapointed in the end. I actually agree with you, now. I just finished this book about 1 day ago, and I was really sad that it ended because it was my favorite book in the world. But to tell you the truth, a book is a book, you’re sopposed to enjoy it. Plus, collind probably would start to run out of ideas and what would happen then? It’d slowly start to get boreing. So then, I thought a movie would be nice, but hearing all this makes part of me not want to see it because of all the gore. Plus, I probably wouldn’t be aloud to watch it until I’m much older because I’m not even a teen. Thanks for posting this, it’s really knocked some sense into me. 🙂 btw, try reading the warriors series, it really rocks. I read the five Overlander books in five days – mostly because I HAD to know what would happen. Although these books are written for middle grade readers, I’m a 66 year old retired English teacher and I loved them. I would really like another (or more) book in this series. Yes, I know the war is over, but what about the ants? The romance between Gregor & Luxa? Lizzie – her anxiety, her puzzle/code skills, her relationship with Ripred? Boots & Temp? A gigantic thank you to Suzanne Collins for gifting us with both this series and with the wonderful Hunger Games trilogy. I recently finished reading the under-land chronicles,I thought they were great!!! I tried to read them when I was about 11 but the fist one, as others have said, didn’t keep my attention very well. I ended up putting it down about half way through. But now as a 15 year old I overheard my dad reading the first one to my little sister who is now 11, they were at about the same spot that I had left off at. After hearing some of the story again, I decided to give them another try, and I’m glad I did! 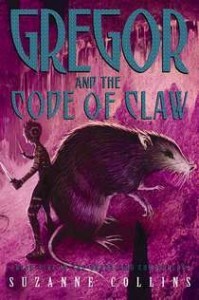 Although I found some of the vocabulary and the way Miss Collins approached some of the issues Gregor encounters a bit immature, and a good deal of the allegory not quite subtle enough, I enjoyed this series and would recommend it to ANYONE who wants a good read, not just 9-12 year olds. I would have liked to have seen more character development in a few characters like Mrs. Carmachi, Narrisa, the diggers, stingers, and cutters in general, Thalia, Gregor’s two friends that are mentioned a few times, and most of all Lizzie, I was disappointed in how little she was mentioned seeing how important the rest of Gregor’s family was to him, and how influential of a role that she ended up playing in the fifth book. 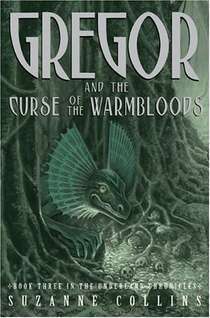 The series also left me with one unresolved question, in the fourth book, both, Luxa and Howard say that it would not work out for Gregor and Luxa to be together because Gregor is an overlander. This confused me because the overlander/underlander thing seemed to work out fine for Hamnet and Hazard’s mother, there is even a term for people who have one overland, and one underland parent, (Hazard is referred to more than once as a half-lander, and Narrisa told Hamnet when he left the palace that he would be with a half-lander child in 10 years, which seemed to surprise but not appall him) I eventually concluded that both Luxa and Howard were just trying to protect Gregor from the ‘Prophecy of Time’ or maybe even thinking of his life in the overland (although this seemed unlikely because no one, save his parents, Lizzie and possibly Mrs. Carmachi had ever seemed to have issues with Gregor staying in the underland for prolonged periods of time even when he should have been in school, or doing various other things) and even if ether or both of those things were the case wouldn’t it have been easier to just use the excuse that Luxa would soon be queen, and probably didn’t need the distraction? There are any number of other excuses that would have been as good or better as “your an overlander so you can’t date our Queen”. None of the answers I have come up with have quite satisfied me and I am left with a nagging question of if Miss Collins could have been trying to hint at something more but waited until to late in the series to develop the idea much more, might the underlanders secretly be racist toward overlanders? Did Howard fear that Luxa might fall for Gregor too and he might eventually try to take away Regalia’s queen? Any ideas or opinions you have are welcome! Help me figure this thing out! Absolutly love these books. I’m 26 and picked them up earlier this year (I listened to the first three on audio book and then read the last two because I couldn’t get through them fast enough.) I read them to my 9 year old nephew, and 13-14 year old nieces, all of them loved the story. (The 14 year old niece cried when they had to set a mouse trap after reading the books.) Even my 70-ish year old parents have enjoyed listening to parts of the stories. I would say they are a book for any age, I love all the characters, they are easily relatable and fun. When you can love and love to hate Ripred at the same time, I think that you have to admit, the main characters are very well written. I think that Collins did a fantastic job with these. Loved your review as well, I thought your points were really well thought out and brought up things I hadn’t thought of yet. I also think that they were both so young and both Howard and Luxa knew that Gregor’s parents didn’t want him to stay in the Underland, so there was no reason to get their hopes up of marriage when they were just twelve and Gregor’s parents were planning on moving him to Virginia. Perhaps because there is a relativliy small population in the Underland they watch the gene pool carefully and that’s why they would be hesitant about letting Luxa marry an overlander? Or also, Vikus mentions in the first book that the Underland is a very had palce for the Overlanders to live, and we assume that’s because they will be hunted by the rats. But then he mentions that the Clark guy died with out the Sun. So maybe they just feel like an Overland couldn’t survive without the sun. Jen- Thank you for your thoughts! I think that they might help some with my question! I love those books so much. this is one of the best series I have ever read. it may be gory, but this is action around every corner with the demented bane at full attack in the last book. I would recommend this to anyone because they are very well told. the beginning starts out slow but then it gets into things as it goes along. I read it, but I thought the ending was lacking innovation because of the love between Luxa and Gregor just suddenly is split for ever. I think a squel where Gregor undying love for Luxa sends he back to the underland. then when he goes in the underland is falling apart and he has to save everyone who lives there and bring them to the surface. Come on! quit critisizing these books! I disagree about it never being a movie. I can Not stop reading these books and have been reading them over and over. I want another overlander book to come out, or a movie about it. Collins is my favorite author and the overlander series are my favorte books that she has written. I n fact they are my all time favorite books. My daughter is 8, and she loves reading. She just finished The Sisters Grimm series and was so disappointed that it ended. A friend suggested this series and I’m just wondering if she’s too young for this series. Leigh, I am not familiar with The Sisters Grimm so I can’t compare the two. I can say that some of the themes might go over her head if she tackles this alone. Plus there are sad parts. You might read it together though. I suggest you read the first one and see what you think. It is a good indicator of the whole series and will give you an idea of what to expect. I read it and enjoyed it as an adult so don’t let the middle grade label keep you form reading it. I was on the fence back when Hunger Games was out and my (then) sixth grade son was interested in reading the book. I was trying to decide if he was ready for the book or not. We ended up reading it together and discussing. I was surprised to find that he handled it quite well and caught many of the themes but was able to open his mind to broader ideas as we discussed the books. He was able to continue the series later on his own but since I had read the books first I was able to continue the discussions. I really hope they come up with book six. I have read this series over and over again. I just cant get enough of it. I also want to find out what happens to Gregor and Luxa. I really hope that by the end of this year or next there is another book. So first of all I have read the hunger games trilogy and gregor the underland series, and in my opinion both are awesome. But if you look closely you will see that both deal with some same basic things like the atrocities of war, their effect and so on. But the hunger games in mi opinion is made for much older audiences. Even though the I agree that the Sunderland’s books can be read by all age groups, but the very young. Anyway I just want to ask Suzanne Collins to do more books of Gregor. They are great books, some how short in my opinion but very sattisfying. But the ending is clue less and left me dumb. I kept looking around the book internet and other means to see if I miss something. This ending is unsattisfying and should be continue because such a good book deserve a good ending. Even the hunger games ending was infinite timesbetter even if it left you thinking of the trilogy long into the night. 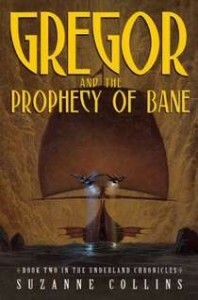 SO PLEASE COLLINS CONTINUE GREGOR THE UNDERLAND SERIES. Andres, I know it’s not the same as Suzanne Collins saying this, but I am actually working on the sixth book right now. I will be putting it on Amazon Worlds (if they accept it, that is) and will make sure it is cheap, because I do agree with you. The ending was way too open, and she did nothing to continue the series, and thus far, her site doesn’t have anything on new books, at least since I’ve checked. I hope that this comment will ease most of your minds about this, and I am making sure that I even stick to the writing style for this story. My goal is to make this as close to Suzanne Collins’s original series, that you actually think you are reading her work. And this is mostly because I believe a good series like this shouldn’t end the way it did.